Two years after the suspension of the highly controversial Transatlantic Trade and Investment Partnership (TTIP), EU member states and the European Commission are preparing mandates for new trade negotiations with the US. But not much has changed: once again corporate lobby groups roam the corridors of EU negotiators working to set the agenda for the talks, while the European Commission covers over its links with big business. In July 2018 US President Donald Trump and European Commission President Jean-Claude Juncker launched “a new phase in the relationship between the United States and the European Union”. Since then, EU and US officials have been busy preparing new trade talks. Both sides published draft negotiation mandates in January. And EU trade ministers could adopt the EU’s mandates in a Council meeting starting today, 21 February 2019. While the Commission insists that “this is a new process, which is unrelated to TTIP”, negotiations could bring in many of TTIP’s most controversial features by the backdoor. Between 2013 and 2016 TTIP met unprecedented public and parliamentary opposition across the EU. Concerns over the trade deal ranged from its threats to public services, the extreme powers TTIP would have handed to corporations to kill public interest laws, to waves of imports of unwanted genetically-modified (GMO) foods and fracked gas into Europe. Now the renewal of trade negotiations between the EU and US are reigniting those fears. Following the massively subsidised construction of new pipelines, terminals and other gas infrastructure, for example, Europe has now become the top buyer of US liquefied natural gas (LNG). This is mostly fracked gas, which is environmentally damaging, climate polluting and has severe social impacts. Imports for US GMO soy to feed EU factory farms have also exploded, and the Commission has just cleared the way for biodiesel made from US soy – even though its own figures say it is twice as bad for the climate as fossil diesel. EU trade with Trump would undermine international climate commitments. Even more alarmingly, the EU wants to restart negotiations on ‘regulatory cooperation’, which would mean things like food standards and safety regulations could, to a large extent, be set behind closed doors by big business and trade experts. The ‘regulatory cooperation’ agenda would be pursued via formal trade talks on so-called ‘conformity assessments’, and a series of informal dialogues outside of the European Parliament’s democratic scrutiny. According to a leaked European Commission document from October 2018, these talks could cover many areas from pharmaceuticals to EU food safety rules (including controversial GMO food and hormone-treated beef). Regulatory cooperation was one of the most heavily opposed aspects of TTIP. It risks introducing severe obstacles to anything that would go against the interests of multinational corporations in EU and US lawmaking, to the detriment of environmental and health protections. The US Chamber of Commerce once called regulatory cooperation “a gift which keeps on giving” for big business. As with TTIP, behind the scenes in the European Commission business lobbyists are dominating the preparation of the negotiations, at the expense of trade unions, environmental and consumer groups. This is revealed by internal documents, which the European Commission released to Corporate Europe Observatory in response to a request under the EU’s access to information rules. 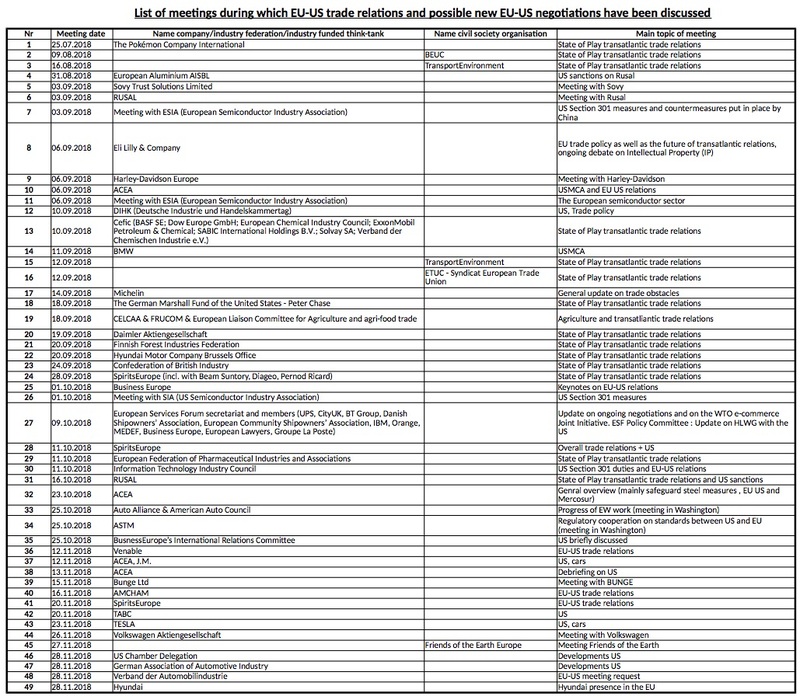 In the four months following the July 2018 Juncker-Trump meeting, officials in the Commission’s trade department discussed transatlantic trade with external stakeholders in 49 behind-closed-door meetings. Only five of these meetings (ten per cent) were with trade unions, environmental, and consumer groups. The other 90 per cent were with companies such as US-based pharmaceutical giant Eli Lily, US agribusiness corporation Bunge, and the scandal-hit German car company Volkswagen, or with business lobby groups such as the European employers’ federation BusinessEurope, and the US Chamber of Commerce. This means that, for every meeting with a public interest group, EU negotiators had ten meetings with corporate lobbyists. This close contact between EU trade negotiators and corporate lobbyists is reminiscent of the TTIP talks, which were largely shaped for and by big business (for a good overview see Corporate Capture in Europe p26-37). The Commission’s frequent get-togethers with corporate lobbyists is particularly worrying when one looks at the industry wish-lists for a transatlantic trade deal. For example, US pharmaceutical lobby PhRMA (Pharmaceutical Research and Manufacturers of America, lobbying for Eli Lily, Pfizer, Sanofi and others) wants to use the upcoming negotiations to challenge European rules on affordable medicines. A cabinet member of Trade Commissioner Cecilia Malmström met PhRMA member Eli Lilly in September 2018. Meanwhile the US Grains Council, which lobbies for agribusiness giants such as Bunge, Cargill, and Bayer-Monsanto, wants to use talks on regulatory cooperation to increase exports of GMO products into Europe, increase EU pesticide residue levels in food, and undermine EU efforts to regulate hormone disrupting chemicals. Officials from the Commission’s trade department met lobbyists of Bunge, a member of the Grains Council, in November 2018. For more than two decades... trade deals have harmed communities... We need a fundamentally different approach to trade – one that prioritises the needs of people and our planet over corporate profits. While the European Commission’s draft mandates for the new transatlantic talks so far only cover tariff cuts and regulatory cooperation, corporate lobbyists are pushing for a much broader TTIP-like trade deal, as envisioned by the US Government. Under such a deal the US Grains Council would push an aggressive market opening agenda for food and agriculture (which would increase pressure on the livelihoods of farmers on both sides of the Atlantic). The US Chamber of Commerce and AmCham EU would demand far-reaching deregulations of services (which could threaten citizens’ rights to basic services like water and health as well as financial stability), tough protections for intellectual property (which could undermine affordable healthcare and medicines), limits to EU data privacy exceptions, as well as other controversial TTIP-style elements. EU chief negotiator Ignacio Garcia Bercero met AmCham lobbyists and a US Chamber of Commerce delegation in November 2018. As for the European Commission, it appears to be trying to conceal its contacts with industry lobby groups that are aiming to influence the future transatlantic trade pact. While the Commission released a list of lobby meetings on the future trade talks in response to an access to information request from Corporate Europe Observatory, it has outright refused to grant access to some of its related correspondence with lobbyists (arguing that it would be too much work). The remaining 55 documents – including reports of meetings with large corporations and lobby groups such as BusinessEurope and the US Chamber of Commerce – have not yet been released, even though the information request was sent nearly three months ago, followed up by several reminders and suggestions for prioritisations. The Commission has also refused to tell the public who exactly is preparing the trade talks with the US. If we had this information it might show which economic sectors will be targeted, as well as the logic they are likely to follow. The involvement of regulators from the European Food Safety Agency (EFSA), for example, would indicate that Europe’s food safety standards were up for discussion. But when we we asked the Commission who was on the “executive working group”, set up by Commission President Juncker and US President Trump to prepare the negotiations, the Commission responded in November 2018 that it did not have a list with the group’s members. It also refused to release reports of meetings, which had happened in the context of the group. The EU institutions need to apply... pro-active transparency about lobbying to allow for proper public scrutiny. More specifically, the Ombudsman had suggested the Commission “proactively publish meeting agendas and records of meetings” with lobbyists, and also to publish all their submissions “unless the sender gives good reasons for confidentiality and provides a non-confidential summary for publication”. In the current EU-US trade talks, the Commission couldn’t be further away from such lobby transparency. The question is: why? What is there to hide? Is it because the EU – like the Trump administration – is willing to cook up a trade deal that would only benefit large corporations? 1. For example, even before the official launch of the TTIP talks, the EU gave in to US pressure and lifted its previous import ban for beef washed in lactic acid. This was despite warnings from consumer groups that repealing the ban would dilute food safety in the EU.